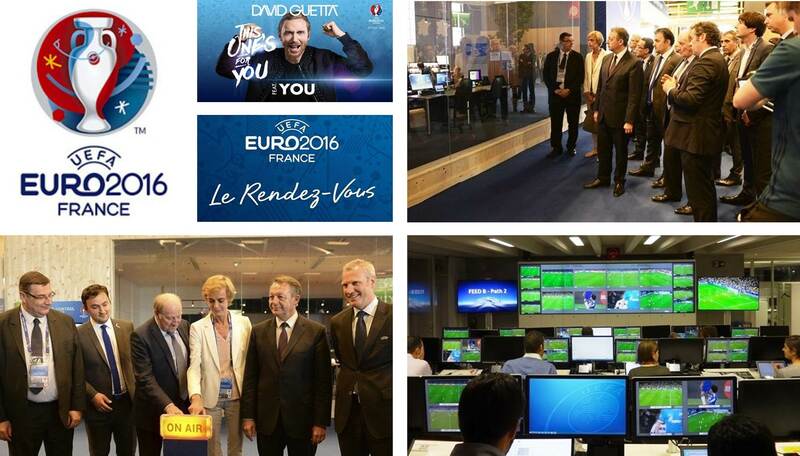 The nerve centre for all broadcast operations at UEFA EURO 2016, the International Broadcast Centre (IBC) in Paris, has been officially opened. The opening ceremony was attended by France's minister of state for sports Thierry Braillard, Paris's deputy mayor in charge of sport and tourism Jean-François Martins, and EURO 2016 SAS president Jacques Lambert, who were also given a tour of the centre. Television signals from the ten venues in France will be delivered to the IBC for distribution to all UEFA broadcast partners. Footage of the 51 matches at UEFA EURO 2016 will then be transmitted across the globe as part of the state-of-the-art coverage of European national-team football's premium event. The IBC is located at the Paris Expo Porte de Versailles exhibition complex in the 15th arrondissement of the French capital, and provides some 17,000 square metres of internal and external space. It houses technical, production and transmission facilities, such as TV studios, production areas, edit suites and offices, and is also the home of Livex, UEFA's content distribution platform. Some 40 broadcasters will be based on site at the IBC. UEFA Host Broadcast is responsible for supplying broadcast partners with live signals of all matches from UEFA EURO 2016 and all additional programming and services – bringing fans even closer to the tournament, the cities and the players. Calrec has entered the French broadcasting market with panache. Outside broadcasting (OB) giant AMP VISUAL TV has chosen the company's Apollo, Artemis, and Artemis Light audio consoles for its landmark new vehicle, marking Calrec's first sale in France. The new truck, the Millenium Signature 12 (MS12), will be the standard-bearer in the AMP VISUAL TV fleet and will make its debut for coverage of the 24 Hours of Le Mans endurance automobile race in June. AMP VISUAL TV maintains one of Europe's largest fleets of OB vans and offers complete, end-to-end services for live and on-location television productions. Boasting the world's largest surface area — 76 square meters — MS12 includes two video studios, two audio studios, and 40 workstations with full 4K UHDTV production capabilities. On May 8th 2016, HDwireless broke new ground at the “World Run – Wings for Life” event in Olten, Switzerland. In order to cover the marathon via wireless camera live signals were transmitted from several motorcycles to a specially equipped plane circling over the race circuit. This craft had been rigged to serve as receiving and transmitting unit, and its live pictures reached the local “WirelessVideoVillage” via a tall signal mast. “On the plane we received the various signals – interference minimized by diversity-demodulators – from where we forwarded them per RF stream to the central receiving station. With this combination of relay plane and wireless technology we are the first providers in the broadcasting market of Germany” says company manager Patrick Nussbaum. Six cameras were used to cover all of the live performances during Sowing the Seeds 2016. Acquisition consisted of two cameras front of house and two more dolly mounted cameras in the pits. With another Blackmagic Studio Camera 4K on stage, the production crew also employed Blackmagic’s Micro Studio Camera 4K to help capture detail shots. Live directors such as Sarah Chu, who was responsible for OMAM’s live to screen, were able to capture little details including close ups of a drum kit and snares, or hands shots to add another dimension to the live program mix they produced. Each camera channel is sent back through two ATEM Talkback Converter 4K to an ATEM 1M/E Production Studio 4K switcher where Chu cut the live program and fed that back out to two 5x4m LED panels at either side of the stage. The German host broadcaster rbb/ARD produced an international feed and a national program of the races on the Beetzsee in Brandenburg close to Berlin. For this purpose rbb/ARD have hired the OBVan Ü7 from TV Skyline, RF camera technology from rentEvent, Cineflex cameras (Shotover) from HD Skycam and a rope camera (RocketCam) from pmt. The races and the victory ceremonies were covered with 22 cameras. Yoshihide Muroya wrote a new page in Japan’s sporting history on Sunday with his first race win – and the first-ever for Asia – at the Red Bull Air Race World Championship stop in Chiba, Japan. The home hero needed luck as well as supreme skill in a breathtakingly close battle, where Martin Šonka of the Czech Republic claimed second, while the USA’s Kirby Chambliss took third. To the cheers – and even tears – of 50,000 home fans, Japanese pilot Yoshihide “Yoshi” Muroya broke through the clouds over Toyko Bay for a breakthrough of his own: his first race win in five seasons of competition for the Red Bull Air Race World Championship. As the only Asian pilot of the ultimate motorsport series in the sky, Muroya showed why his countrymen call him “Eternal Pioneer,” logging a historic first for Japan and the entire continent as well. Already well established in Asia, eGaming is becoming a global phenomenon. Dutch entertainment and sports production company Watertube.tv is producing an ambitious and innovative e-gaming competition of the popular online game League of Legends. Now in its first 10-week season on Fox Sports, Inside eSports is a Dutch College League competition held at Vue Cinema in Hilversum. By elevating the Dutch College League competition to a live broadcast, complete with referees, officials and match commentators, Inside eSports brings the excitement of electronic gaming to the broadcast audience, with a live audience in a cinema stadium. Blue Man Group is a heady mega-mix of music, technology, art and excitement which immerses and delights audiences by wrapping them in its infectious beats and vibes. Lighting plays a crucial role with a dynamic and energetic maelstrom of color, movement and emotion. When Blue Man Group’s Las Vegas show moved back to the Luxor at the end of 2015, it was an ideal opportunity to upgrade and change certain aspects of the lighting rig to optimize the more intimate venue. The space ideally lent itself to more compact fixtures to fulfill Tony award-winning lighting designer Kevin Adams’ visual concept, which had been developed in 2013 when the Blue Men had moved a new show into the Monte Carlo Hotel. For many show designers, it can be frustrating to see countless audience members gazing at I-Mag screens for prolonged spells, rather than concentrate on what really matters: the stage action. In conjuring her set design magic for Beyoncé’s eagerly anticipated Formation world tour, however, Es Devlin* has ensured that all eyes remain on the star’s performance by creating an enormous, rotating video screen box – widely referred to as the ‘Monolith’ – that relies heavily on customised equipment and R&D know-how from Stageco’s international offices. From the moment the audience enters the stadium, well before showtime, it is aware of the central, dominating Monolith. Measuring 22m high x 16m wide x 9m deep, the crucial elements at its core have been custom-manufactured and supplied by Stageco in partnership with Belgian motion control systems provider WIcreations. The Monolith is embedded in a 62m wide x 35m deep stage. On May 24, 2016 ABC’s Dancing with the Stars Season Finale offered online viewers a full 360º view of the main stage for the duration of the hour-long broadcast. Shot with 4 GoPros mounted to Teradek’s proprietary rigging system, the 360º live broadcast allowed fans of the show to feel like they were part of the audience, giving them the freedom to look in nearly any direction to see what was happening. Sphere is a 4-channel H.264 encoder about the size of an Apple TV that compresses and streams 4K (4x 1080p30) footage to an iOS or OS X device for real-time stitching. Once stitched, the 360º content is streamed directly to any online video platform that supports 360º video. Official technical supplier for the event [LITE]COM supplied the extensive package of Clay Paky, Robe, Philips and Aquabeam fixtures with partners AED Distribution and Woodlite. Working with Eurovision’s technical and creative teams, lighting designer Jönsson arranged the Scenius above the stage on straight truss. From here the fixtures worked with the Mythos, Sharpy and Sharpy Wash 330S to complement the ‘infinity’-style perspective of Frida Arvidsson and Viktor Brattström’s bold set design. NEP Swedens HD1 OBVan covered the event for EBU. Find the views on the event from Aquabeam, Clay Paky, Aerigon, EBU, MA Lighting, Fix8 Group, Philips, Robe and XLNT and how they managed to create one of the most watched events in the world. The new broadcast center for the Sha Tin racecourse has recently been equipped with an IHSE Draco tera KVM matrix switch system. The extensive installation is capable of connecting all broadcast and data servers and presentation computers located in the first-floor central equipment room, to workstations, edit suites and control desks in the broadcast studios and other areas throughout the building. The integral redundant capability and back-up of the Draco tera KVM switch, combined with its hot-swap component ability provides complete confidence that equipment can be maintained and replaced without disruption to live broadcasts: an essential feature for live horse racing broadcast services. Lawo will supply seven mc²36 live broadcast audio mixing consoles to Sky Germany’s new SNG fleet for use in sports news HD and live sports production. The Lawo consoles are identically configured with 16 faders, 192 DSP channels and a routing capacity of 512 x 512 crosspoints. The SNGs are dedicated to the sports news HD and live sports productions and are currently being built in the UK. The SNGs’ flexibility will leverage Lawo’s IP-based mixing technology to further optimize production processes within the Sky Sports division. Sky says that further reasons for installing the mc²36 mixing consoles in the new vehicles include easy handling and the implementation of requirements – from simple switching for a live news channel to complex three-camera assignments with live commentary – plus future options for remote production. "We were very impressed with the level of real demand for the next generation IP-based broadcast systems. We had an overwhelming response to the new systems we launched in Asia for the first time at BroadcastAsia. From revenue-generating systems like Paywizard and Starfish right through to the revolutionary Electricfriends camera robotic system that we use to great effect with Vizrt in their augmented reality demos," said Fintan Mc Kiernan, Chief Executive Officer, Ideal Systems SEA. The Post Production Hub at BroadcastAsia also saw overwhelming interest from visitors, drawing huge crowds daily to the booths and presentations. Visitors had the opportunity to hear from Oscar and Grammy nominated producers, award-winning film makers and sound and visual effects experts, with content ranging from modern filmmaking techniques and technologies, how Hollywood drama uses LED lighting, to the art of refining sounds bring scenes to life. Elemental Technologies is providing the technology platform for a rush of new 4K Ultra HD (UHD) over-the-top (OTT) and direct-to-home (DTH) services in South Korea. Market leaders telco KT and SK Broadband have both launched UHD services using Elemental high-efficiency video coding (HEVC) software. Asia represents one of the world’s fastest growing UHD markets, with Korea reported as the largest UHD TV market in the region by research firm GFK. Both KT and SK Broadband have chosen to offer 4K UHD as a key part of their offerings, in an effort to provide high quality content in their programming. The first 4K services were made available in June 2015, powered by Elemental Live and Elemental Server video processing. To meet their expanding needs, both companies have already ordered extensions to their installations in 2016. AB Groupe, France’s first independent broadcaster and one of the largest producers in the country with 16 television channels, selected ATEME’s TITAN Live to broadcast its first native 4K-UHD premium channel. The channel, called Ultra Nature, has been available in France since May 19th and is dedicated to wildlife, discovery, travel and extreme sport. TITAN Live is a high video quality, high density pure-software encoding solution designed for cable, DTH, and OTT. It can run on any commercial off-the-shelf server, in any environment, providing reduced time to market and lower operating costs. ATEME’s “building block” approach provides even more flexibility as software modules can be combined as needed for any input/output, any CODEC, any resolution, from the most basic encoder to the much more complex video headend. NEP Visions, one of the world's most distinguished outside broadcast service providers, chose a Leader LV5940 4K multi-format waveform monitor as the master reference instrument during the recent UHD capture of Martin McDonagh's play, Hangman. Performed at the Wyndham Theatre in London's West End, the production has received very positive reviews including an accolade from The Telegraph as 'the best new play of the year'. The resultant 173 minute production, starring David Morrissey, Andy Nyman and Johnny Flynn, has been delivered to Vue Cinema audiences around the UK as a 4K Digital Cinema Package. It was created by National Theatre Live in partnership with the Royal Court and Playful Productions.